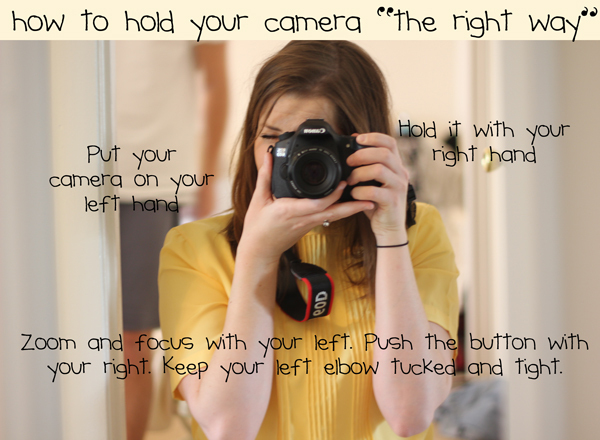 Did you know there is a “right way” to hold your camera? You probably did. But it was news to me. Oops! My favorite hold, the “one-hander” isn’t really very efficient when it comes to clear photos. I learned the right way this week and thought I would share it with you. It was uncomfortable for a little while but now I’m used to it. It’s easier to hold the camera steady like this. Thanks for sharing… :) Happy Sunday! I saw you made it through to the next round of Crafting with the Stars. So exciting! Who knew? I sure didn’t. Maybe I will take a class when (I mean if) I get a nice camera. Must try it! You look very professional holding the camera like that. By the way…I’m giving away an apron this week…come over and see if you want to. I’m going to have to give it a try too. I’m queen of the one handed bad photo shot!